Meredith is a rural township 80 km west of Melbourne, midway on the railway line and highway between Geelong and Ballarat. In the early 1850s Meredith was situated where some local roads intersected at Coolebarghurk Creek, and Watson's Golden Fleece Hotel was opened. A town survey was made in 1851-52, and the name was apparently given in honour of Captain Charles Meredith, at one time a police magistrate at Port Sorrell, Tasmania, and husband of Louisa Ann Meredith, writer and artist. An Anglican school was opened in 1857, and the Catholic church (1861) also had a school. The railway line from Geelong to Ballarat, via Meredith, was opened in 1862. 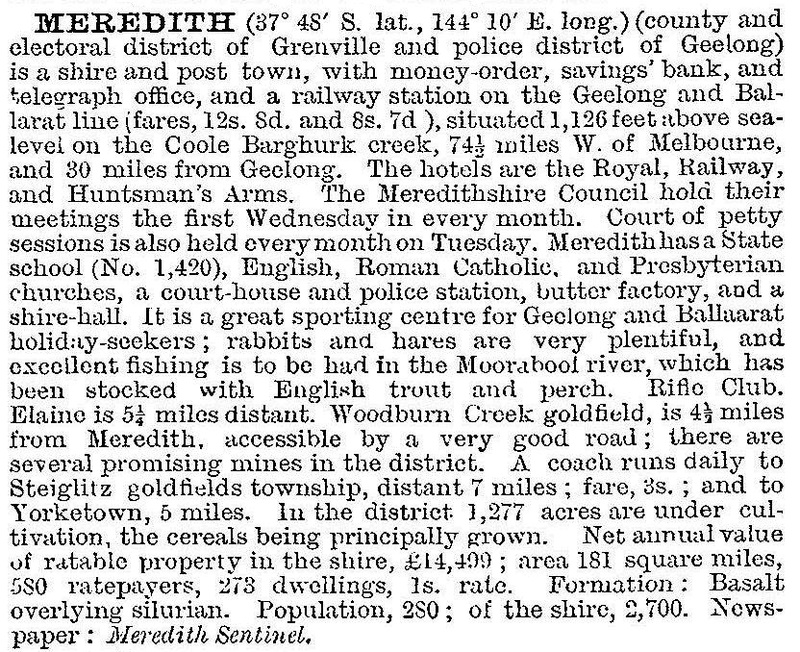 Meredith was proclaimed a Road District in 1863 and a shire on 28 April 1871. The bluestone railway station (1862) and shire hall (1878) are on the Register of the National Estate. Meredith Shire absorbed Steiglitz borough in 1879, and was itself amalgamated with Bannockburn Shire on 15 September 1915. Its area was 470 sq km and it included the village of Anakie. The mechanics' institute was opened in 1905, later becoming a memorial hall. Several sporting clubs were begun around the turn of the century, a notably successful one being the rifle club. The flat grazing country around Meredith was prone to fires, and a fire brigade was formed in 1913. A progress association succeeded in having avenues of trees planted in Meredith, adding to the hillside on which the town is situated. During the years after World War II, Meredith's population declined by about one third, but immediately following the 1970s there was modest growth. Meredith has a golf course, a recreation reserve, Anglican, Catholic and Uniting churches, two halls, two hotels, pre-school facilities and a school which had 70 pupils in 1998 and 100 in 2014. The original bluestone school building (1874) is used in conjunction with later additions. The town has an annual music festival (1990) held in December which attracts about 10,000 patrons.